As a little girl my very favorite Christmas ornament was one that my babysitter Janet Maxwell gave to me. Janet was cool and would tell me about the U2 and Go-Go's concerts she would go to, she drove a blue car with yellow polka dots and she was a cheerleader. To me Janet hung the moon so when she made my sister and I Ice Cream Cone Christmas ornaments you know I thought they were they best thing to happen to December 25th since Rudolph. I had long since forgotten about Janet and her crafty cones until I was recently flipping through a copy of Better Homes and Gardens Christmas Ideas for 1961. The kitschy holiday pictures and crafts had me turning the pages like this baby was straight off the New York Times Best Sellers List. 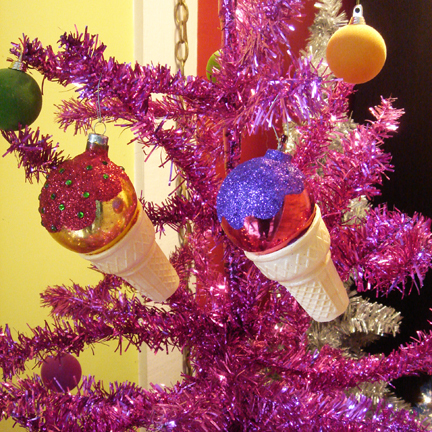 Then there it was... the Ice Cream Cone Tree on page 27 and the memories of Janet and her ornament came rushing back. As you might recall from my customized cartons, loquat and pumpkin flavors and even painted tights - I kind of have a thing for ice cream cones. Maybe it all started with Janet and her ornament. Today for I Love to Create I am going to show you how to make your very own! 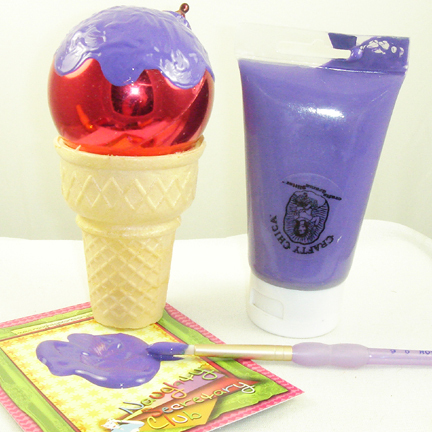 The first thing you need to do is glue your ornament into your ice cream cone. Remember you can use a plastic or glass ornament, solid or printed - you name it. You just want to be sure to leave the part with the hanger out of the cone. Speaking of cones if you are more of a sugar cone guy or gal go for it! I used Liquid Fusion Glue along the rim of my cone to anchor my ball in place. You could stop there, but why? I like to think if you are reading the Naughty Secretary Club blog you too are a firm believer in the more is always better philosophy. That being the case let's put some topping on that cone. I used Crafty Chica paint and free handed a yummy topping onto my Christmas ball. While the paint was still wet (and fairly thick) I sprinkled on Tulip Fashion Glitter. Allow to dry. If you are going to take the step of adding an ooey gooey glittery faux candy dipping sauce, what's a few rhinestones? 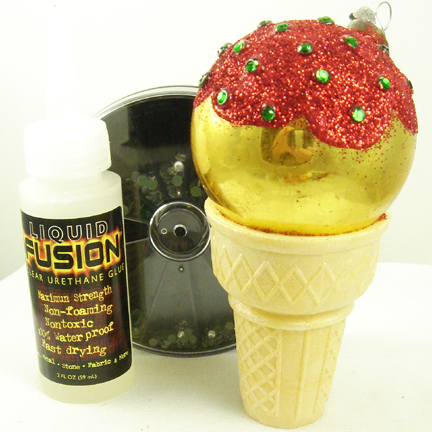 Using your Liquid Fusion Glue add small dots randomly around your cone and stick in your rhinestones. Allow to dry. These ornaments look good enough to eat, though I would not recommend it. Speaking of, just because you would not eat these ice cream cones does not mean someone (or something) else wouldn't. When storing your cones I recommend a zip lock bag so hungry little attic vermin don't decide to snack on your cone during the other 11 months of the year. 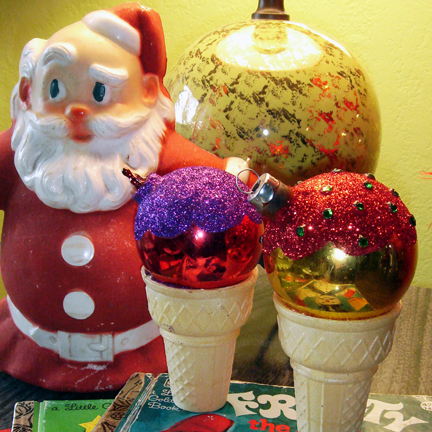 Buy yourself a pack of cones, some crafting supplies a cheap box of ornaments and get crazy! You can use all kinds of color combinations, leave off the glitter if you want, glue a fake cherry on top, what about a double dip cone? The possibilities are endless.